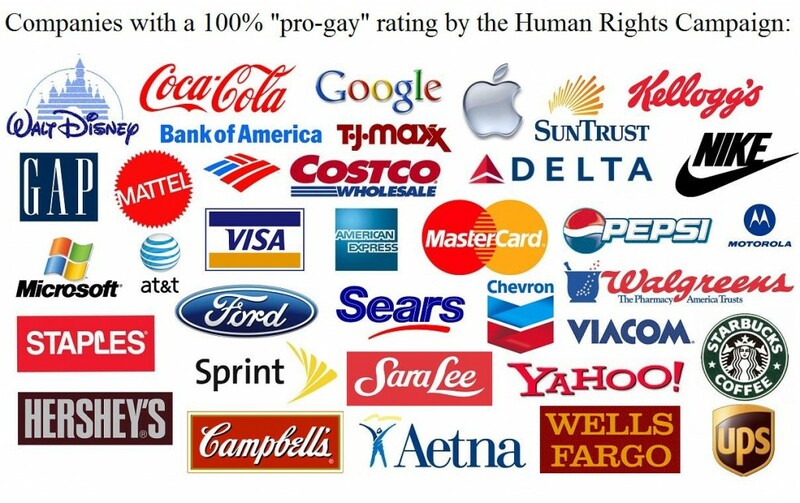 What makes a company “pro-gay”? Church this morning nearly gave me a migraine. See, a fair portion of the service was related to all the Chick-Fil-Hate hullabaloo this week, and the deep pain that it caused so many people. I’d spent the week arguing, raging, seething and hurting over the immense hatred that was flowing from the “gotta have straight chicken” and their “but what about the free speech red herring?” compatriots. It was an exhausting week, and while it was wonderful and healing to be amidst folks who shared in the hurt, just revisiting the topic sent my neck and shoulders back into the tension of that rage. The pastor’s message of “Hold on, better times are coming” was wonderful, but I still needed a massage when I got home. While the plate was passed for the offering the image below was projected up onto the wall, I assume as a reminder that there are companies who aren’t trying to have people killed for being gay. The image, and the idea behind it, just don’t sit well with me. You can see HRC’s criteria for their Corporate Equality Index here. That’s the list of things they use to determine if a company is “pro-gay” as described in the above image. But there’s so much that they leave out. Coca-Cola may have wonderfully inclusive insurance, and they may include orientation and identity protections in their hiring procedures, but they also have a history of murdered union workers in their bottling plants in central America. What does it matter if they won’t discriminate against you for being gay if they’re just going to have you killed for demanding safe working conditions and fair wages. Their corporate headquarters may be a great place for LGBT people to work, but I’d bet those plants are not. The same can be said of the factories that produce Apple products, Nike’s sweatshops, Gap’s sweatshops and Hershey’s child-slave farmed chocolate. Even here in the US, Starbucks has a history of union busting. Those are just the ones I knew about off the top of my head! Hiring practices and sponsoring Pride parades don’t mean jack when you’re mistreating and killing your employees. You can’t be pro-gay and pro-slavery. Queer people are slaves. Queer people are union organizers. Queer people are textile workers in sweatshops. Playing nice in the public eye doesn’t make you “pro-gay,” not when your murder, exploitation, slavery and unfair business practices affect queer employees and their families. You can’t be “pro-gay” when you’re anti-human.